Take a drop of seawater and look at it under the microscope, and you’ll see some pretty amazing stuff: That tiny splash of the vast ocean is brimming with plants, baby animals, bacteria—a veritable cornucopia of life. Now take a “drop” of the night sky, maybe a section of that seeming void about the size of the full moon’s disk. This wide-field image, released May 5 by the European Southern Observatory, isn’t just full of stars. Each point in there is actually a galaxy of stars, some near enough that we can see their familiar shapes, and some so far away that they appear as mere blobs of ancient light. ESO was apparently most interested in this drop of sky because it offered a view of a massive galaxy cluster, a family grouping of yellowish galaxies known to astronomers as Abell 315. Gravity is a driving force in the universe, and galaxy clusters are the biggest structures held together by its power. It might seem odd to think of a gaggle of galaxies as a structure. After all, to every wavelength of light we can detect, from radio waves to gamma rays, it looks like there’s a whole lotta nuthin’ between each galactic building block. The trick is that a lot of the gravitational “glue” in a galaxy cluster is actually coming from mass that we can’t see. You guessed it: dark matter. While we can’t see dark matter, we can tell something must be there, because lots of things in the universe don’t look or act the way they should if visible matter was the only player. In the case of Abell 315, light from galaxies behind the cluster gets twisted up by some unseen stuff, causing astronomers to see oddly shaped galaxies. Analyzing the degree of oddness can tell scientists how much stuff must be out there, based on the mass needed to bend the galaxies ever so slightly out of shape. 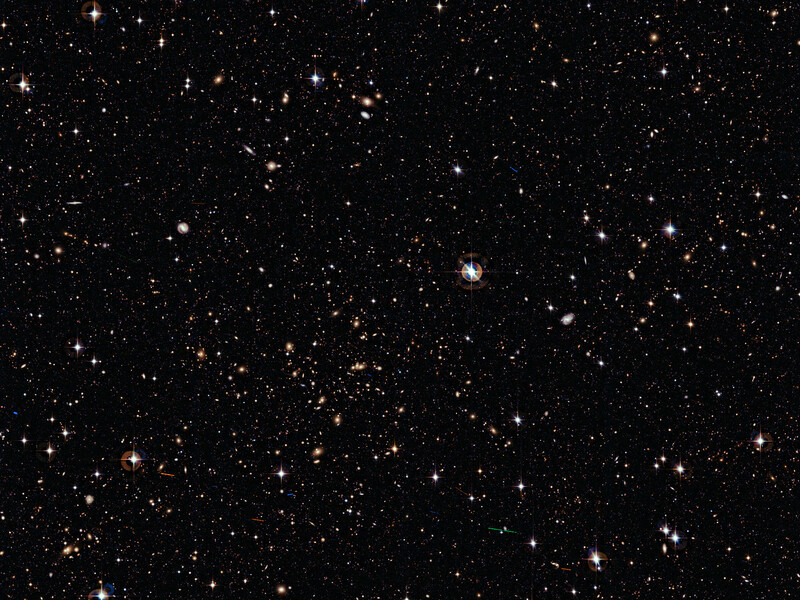 By looking at ten thousand galactic oddballs in this picture, astronomers concluded that Abell 315 has a total mass that’s over a hundred thousand billion times the mass of our sun. Yowzers. In addition to probing cosmic mysteries, ESO’s “long shot” captured a few of our neighbors passing through. The multicolored streaks mostly near the bottom of the frame are asteroids in the main belt of our solar system, which sits between the orbits of Mars and Jupiter. Images like this are perhaps most famously made by orbiting observatories, such as the Hubble Space Telescope’s Ultra Deep Field. But this picture, made by a 2.2-meter telescope in the Atacama Desert of northern Chile, shows that ground-based observatories are catching up, because they’re finding ways to compensate for the atmospheric distortions that make stars twinkle and that mostly made for blurry pictures of galaxies until recently. Last month ESO announced that Atacama will also be home to its next big project, which is being billed as a ground-based ‘scope that will see even better than Hubble: the European Extremely Large Telescope. This gargantuan telescope with a 42-meter-wide mirror is designed to peer into the earliest moments of the universe, examine the atmospheres of planets circling other suns, and offer deep-field pictures—like this one but much higher resolution—that will unravel mysteries of dark matter and its even more elusive counterpart, dark energy. Now that the site’s been chosen, construction on the EELT can begin as early as this year, but the scope won’t be operational until 2018. In the meanwhile, I *guess* we’ll have to make do with what ESO’s other instruments can provide. Not that I’m complaining!